Shining a Light on ‘Back Row’ America Chris Arnade’s photos reveal an America that is battered but standing, atomized but holding on. I want to end this dramatic year writing of a man whose great and constructive work I discovered in 2016. He is the photojournalist Chris Arnade. I follow him on Twitter, where he issues great tweet-storms containing pictures and commentary about America. (His work has also appeared in the Guardian and the Atlantic.) He has spent the past year traveling through much of the country taking pictures of regular people in challenging circumstances and writing of their lives. He is politically progressive and a week before the election angered his side, and some media folk, by foretelling the victory of Donald Trump. The people he met were voting for him. Many saw the America they’d grown up in slipping away. They wanted a country that was great again. They experienced elite disdain for Trump as evidence he might be the one to turn it around. And so his 2016 trek. By this weekend he will have traveled 58,000 miles throughout America in his 2006 Honda Odyssey. He went to small towns and cities through the northeast and down South, through the Midwest and the Rust Belt, through forgotten places with boarded up town centers. He met retired welders and drug addicts and valorous families getting by with nothing. He saw modest and embittered people who’d seen the places they grew up in disappear. He met Minnie McDonald and her granddaughter, Madison Walton, visiting the graves of Minnie’s daughters in Montezuma, Ga. He met five little kids in Selma, Ala. “Do you like Selma?” he asked. All were quiet. The littlest said, “Noooo.” Why? “Too many shootings, too many deaths,” said another. Penny Springfield, a middle-aged white woman, met Mr. Arnade in the empty church where she’d buried her son Johny, who died from an overdose. In his work you see an America that is battered but standing, a society that is atomized—there are lonely people in his pictures—but holding on. Two great and underappreciated institutions play a deep role in holding it together. The other institution that helps hold people together is McDonald’s. Mr. Arnade didn’t intend to discover virtue in a mighty corporation, but McDonald’s “has great value to community.” He sees an ethos of patience and respect. “McDonald’s is nonjudgmental.” If you have nowhere to go all day they’ll let you stay, nurse your coffee, read your paper. “The bulk of the franchises leave people alone. 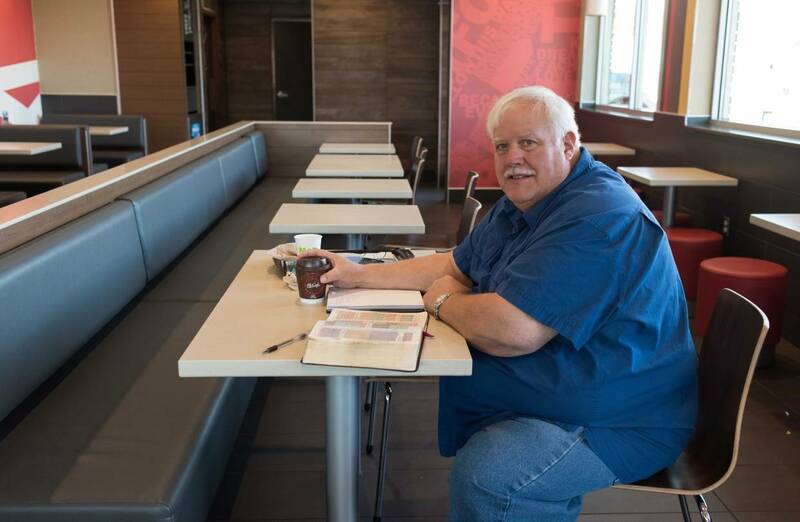 There’s a friendship that develops between the people who work there and the people who go.” “In Natchitoches, La., there’s a twice-weekly Bible study group,” that meets at McDonald’s. “They also have bingo games.” There’s the Old Man table, or the Romeo Club, for Retired Old Men Eating Out. Happy New Year, everyone. May we do work worthy of the moment.